According to the Canadian Institutes of Health Research, 1 in 5 Canadians will experience a mental health issue in their lifetime. Today, in honour of Bell Let’s Talk Day, the Healthy Workplace Group brought together staff from across the School to discuss mental health in the workplace over lunch. Participants learned about wellness programs for NOSM learners and residents, including our new wellness rooms in Sudbury and Thunder Bay, and our new app NOSM Well. The event was also an opportunity to discuss resources available to staff and what a healthy workplace looks like to them. 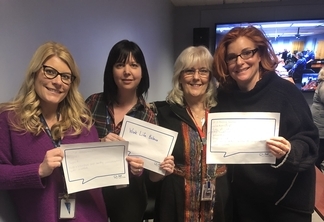 Join the conversation: For every text message, mobile and long distance call, Bell Let’s Talk Day video view on social media, tweet using #BellLetsTalk, use of the Bell Let’s Talk Facebook frame or Snapchat filter, Bell will donate 5¢ to Canadian mental health initiatives.